We took a trip to Howes Models of Kiddlington near Oxford the other day and came away with one of Heljan's DP2 prototype diesels. 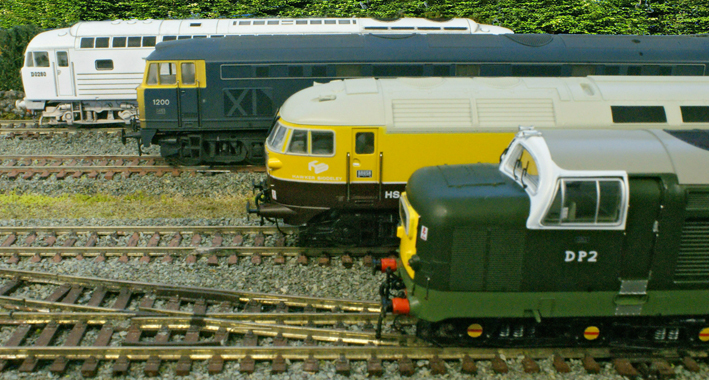 We have been wanting to acquire one of these lovely models for some time now because it means that we have all four for Heljan's prototype main line diesels in our fleet - and all can be seen lined up in the photograph above. Currently only two of these locomotives are fully operational, namely Lion and Falcon. These have both had Howes sound decoders fitted and have been lightly weathered by Alex of Mikron Models in Taunton. Kestrel and DP2 have yet to be fitted with decoders and, once they are, they too will be lightly weathered and ready to start hauling trains on the remodelled Lakeland Railway. Seeing them all together here makes me wonder if any of the full size prototypes ever met during their all too brief lives.